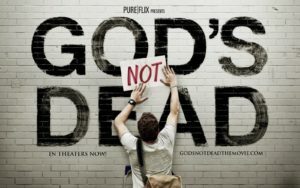 After watching the initial trailer (see below), I came into the Christian film, “God’s Not Dead” with an obvious bias. To be honest, I wasn’t even sure I wanted to waste two hours of my life watching it. However, as a skeptic it is always important to keep an open mind and be willing to re-evaluating our own biases and opinions. With that said, I actually really enjoyed this film for many reasons some of which are not exactly what the filmmakers intended. For starters, this film was relatively well made, with much better production value than other Christian propaganda movies. While it certainly won’t be winning any Academy Awards, it was wildly entertaining despite the one-dimensional characters. Aside from Josh and Professor Radisson, I doubt anyone who saw the movie could name a single other character by name with the possible exception of maybe Pastor Dave – and that’s only because the foreign missionary kept repeating, “God is good Pastor Dave” over and over again. None of the other characters needed names anyway, but some of them might have needed some actors who could actually act. Still, the acting was better than any of the other standard Christian propaganda movies so I’ll cut the filmmakers some slack on that one. For the most part, the characters just served as pawns to be used to drive home the heavy-handed message of the film. Take Josh’s girlfriend of six years as an example. She doesn’t want Josh to take on this challenge against his philosophy professor. They argue over it and despite both being very vocally Christian this minor disagreement causes her to break up with him on the spot. Maybe if they were dating for six months I could see it, but six years? To me, that indicated that there must have been other problems in their relationship. The film not only makes no mention of relationship troubles, it goes out of its way to show that their relationship was perfect except for this minor disagreement. The scene’s real function was just to play up Josh’s persecution. Even his devoted girlfriend is against him. He is sacrificing the love of his life just for the opportunity to defend Jesus’s reputation against an evil, authoritarian, arrogant atheist. Apparently the all-powerful creator of the universe needs a college freshman to defend his honor. Another example of black and white characters is Dean Cain’s character. I don’t really know his name and I am not even sure it was given so I’ll just call him Superman. Superman is a cold-hearted lawyer who only cares about his wealth. His humanist girlfriend is basically just a trophy in his eyes. Her worth is defined by her ability to do stuff for him. In an attempt to show just how cold this evil atheist is, Superman breaks up with his girlfriend right after finding out that she has cancer. Here I think the film missed a key opportunity to really explore an interesting psychological issue in favor of pushing its heavy-handed message. The message here is that Superman is just a cold-hearted atheist. They could have made this more interesting with a little more nuance. Maybe he isn’t so bad. Maybe he’s just afraid. Maybe he loves his girlfriend and the thought of her dying hurts him so much that he decides that he could best protect himself from the grief by ending the relationship. Was it the right decision? No, but is it an understandable one? Yes. Grief is a powerful emotion and the fear of grief might cause a good person to make a bad choice. This is something I like this “God’s Not Dead;” it introduces various situations, concepts, and ideas that are worth exploring. Unfortunately, the film itself doesn’t explore these issues. That level of complexity doesn’t support the message of the film, so Superman just becomes a one-dimensional character that the audience can hate. Still as a master philosopher and a humanist, it creates a great teaching moment to talk about grief and how people deal with it. Superman also has a hard time visiting his mentally ill mother in the hospital until the end of the film. The movie is trying to portray him as an unfeeling and ungrateful son, but again it seems to me that he is afraid of being emotionally scarred by the grief that he, for all practical reasons, already lost his mother and that grief leads him to fear. That fear has caused Superman to make the poor choice of not visiting his mother until the end of the film. Unfortunately, his visit was used not to help the character deal with his emotional pain, but rather as a heavy-handed way to push Christianity on this now emotionally vulnerable atheist. The movie tries to show the authoritarian atheist professor as preying on the weak (which he does), but in the end we see that it is Christianity that preys on the weak. Josh goes after Radisson when he is emotionally distressed about his girlfriend leaving him and Josh exploits his emotional pain concerning the loss of his mother, who died from cancer when Radisson was young. When Radisson is dying in the street, he is most vulnerable and that is when Pastor Dave goes after him. Instead of trying to save his life or respect his life, he tries to push Christianity on him. Pastor Dave even makes a point to tell our dying antagonist that God gave him these last few moments of suffering and pain so that he can convert to Christianity and be spared from eternal torture – Because “God is good.” Funny, I thought God was supposed to be all-knowing too. Wouldn’t God know what was in Radisson’s heart without Radisson having to voice it as he suffers needlessly? It is climatic moments like this that make me laugh. The filmmakers just couldn’t help themselves. Their heavy-handedness becomes so obvious and silly that it undermines the message they are trying to get across to anyone who isn’t already in their fundamentalist bubble. It is this scene, which celebrates suffering and death that really shows the cruelty of Christianity. Another great sub-story that illustrates this deals with an Arab student from a Muslim family. Her fundamentalist Muslim father makes a point to tell her how much he loves her and that he wants her to follow all the rules of Islam because they are Allah’s rules. Even though these rules are hard for her, her father insists that they are for her own good. Basically, one could easily imagine a fundamentalist Christian father having this same conversation with his daughter concerning God’s rules of modesty or purity or something. The situation with this Arab student escalates. She’s actually a secret Christian and her younger brother finds out and rats her out. In a fit of rage, her father hits her and kicks her out of the house. She has been shunned and disowned by her family all because she loves Jesus instead of Allah. The sad part is that it is just as easy to imagine a fundamentalist Christian father doing the exact same thing upon discovering that his daughter or son was an atheist. That story actually plays out quite a bit in the United States. 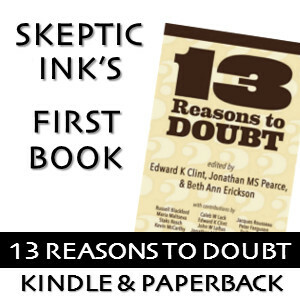 Many atheists do get disowned by their religious parents after coming out of the closet as either an atheist or as gay. So in an attempt to show how horrible Muslims are and how much Christians suffer and are persecuted for their faith, the movie actually hits on a major problem of religion in general. Faith makes people irrational, often causing believers to choose the love of Allah or God over the love of one’s own children. As a result, those children are often forced into the closet when they reject the beliefs of their religious parents or if they are gay — an issue the filmmakers didn’t dare bother to explore. Again, this is a very teachable moment in the film. I love all these great teachable moments and that is why I surprisingly like this movie even though I definitely disagree with the obvious message of the film. Sure Josh delivers some interesting point dealing with what came before the Big Bang, claims that morality comes from God, and then presenting his knock-out punch of atheists are angry with God, but he never actually responds to the criticisms of those arguments. He just uses some clever sound-bytes and rhetoric that sound great on the surface. Anyone that actually Googles any of these questions would quickly discover that his points are all just smoke and mirrors. 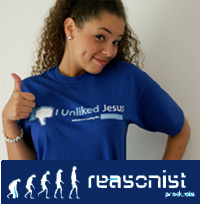 Hell, I even addressed every one of these arguments in my Atheism 101 series that used to be on the now defunked Examiner.com website. The “Dead Poet Society” moment where the class slowly rises in support of Josh by declaring that “God’s not dead,” was truly hysterical. It was almost disappointing that they didn’t stand on their desks. Despite disagreeing with the message of this film, I give it 4 out of 5 stars for the teachable moments it presents. “God’s Not Dead” is now available on Bluray. Author’s Note: A version of this review was originally published on Examiner.com on August 13, 2014. Unfortunately, Examiner.com is dead, so I am resurrecting this review here with minor changes.